Spiderweb turquoise and gem silica inlaid silver ring. Our Products >> Spiderweb turquoise and gem silica inlaid silver ring. Cuff bracelet with sugilite, chrysoprase, opal, chalcosiderite. 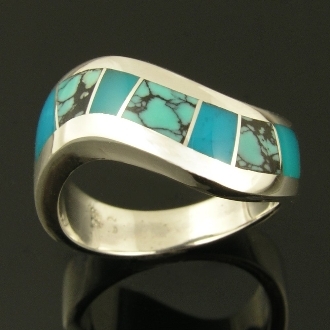 Woman's silver ring inlaid with chysocolla and turquoise. Woman's curved channel inlay ring with spiderweb turquoise and gem silica by jewelry artist Mark Hileman. This ring features unique blue spiderweb turquoise with black matrix mixed with translucent blue gem silica inlaid in a gracefully curved mounting. The ring is 7mm wide and is shown in a size 6 for scale. This ring will be made to order in your ring size 4 to 6 weeks. Other inlay materials are available as well as metal options such as gold, stainless steel and Continuum sterling silver.